Fills in small cracks and smooths rough surfaces on grey weathered decking wood, making it look as good as new. 2.5L covers approximately 10m2 on ridged boards, and 12m2 on smooth planed boards. Requires 2 coats, leave 4 hours between each coat. 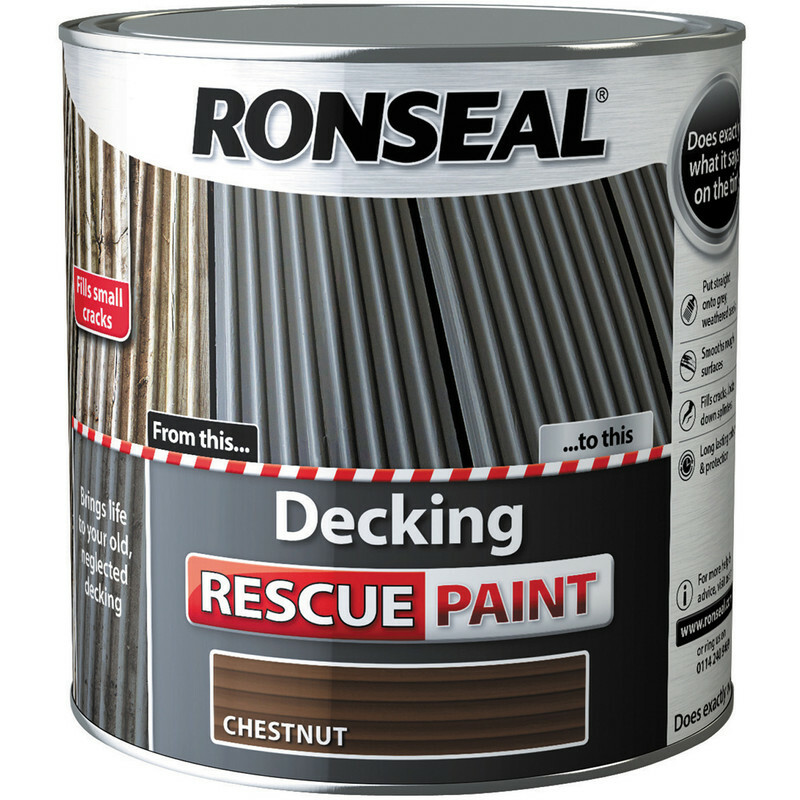 Ronseal Decking Rescue Paint 2.5L Chestnut is rated 4.6 out of 5 by 25. Rated 4 out of 5 by Jezeroo from Great Product I bought this product after doing quite a bit of research about what might be best for my decking. It had been previously painted but not with the right stuff. I wanted something to bring the decking back to at least looking better. When painting it on it’s easy to do and it does look much better. The only reason I’ve given 4 stars is that I didn’t get the coverage that was expected but I think it’s due to the fact that my decking was in quite a bad state and therefore the paint soaked in more. Rated 5 out of 5 by LIPPY from Covers so well Used on decking and handrails excellent coverage. Make sure you give the tin a good stir. Rated 5 out of 5 by Jez L from Good result Not cheap. But does what you expect it to. 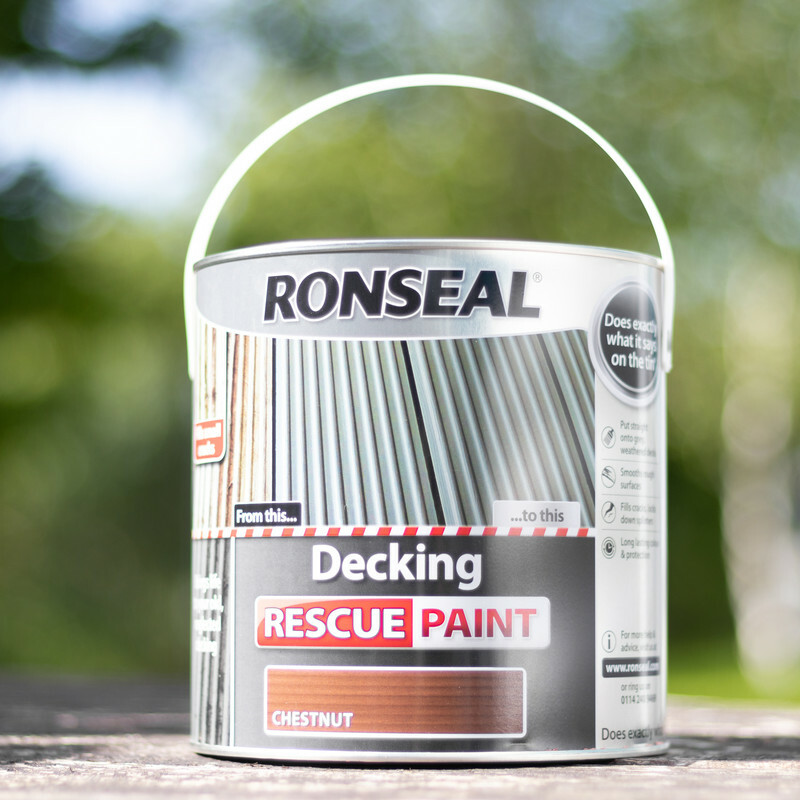 Rated 5 out of 5 by Sham82 from Great product I bought this two weeks ago to paint chipped decking and discoloured decking. I was very happy with the product the decking looks amazing. I just hope it lasts but this seems better than the decking stain by ronseal. Great price compared to other stores! Rated 5 out of 5 by mall from A really thick rich paint My decking was looking very tired. It was basically sound, but the colour was patchy, and the grain had opening up in places. I jetwashed to remove all loose debris, let dry for 24 hours, then applied a coat of this. It definitely does fill small cracks etc, but because it’s so thick and rich, I used quite a lot. Needed to buy a second tin to apply the second coat. Deck looks excellent.